Borra caves is the heart of terror of the tourists. Thousands of bats are set up in the world's most famous Borra caves. Scientists have expressed concern over the visit of the Brahmagahas in the wake of the fact that the bombs were responsible for the death toll of the southern states. There are about four thousand tourists daily per day for the borough caves. On Saturdays and Sundays, up to six thousand people visit. The borough caves are not from the various states of the country ... the foreigner's collision is also high. There are also Kerala residents who visit the Borra caves. 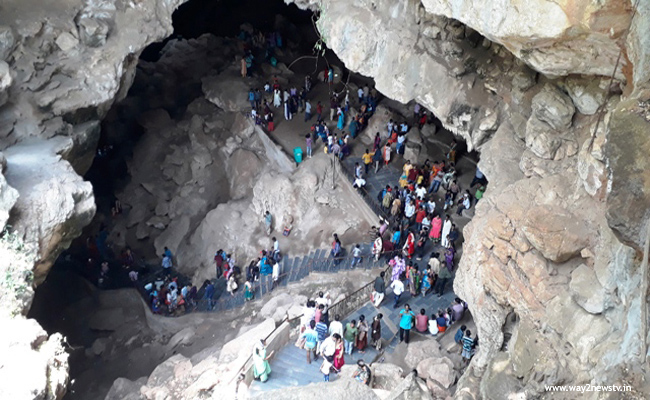 Travelers who are now visiting Borra caves are furious because of the possibility of spreading the virus through bats. The mechanism has been alerted to the infectious virus in places where the bats are not in track. Such is the cause of thousands of tourists going to thousands of bats in the bats. Bats eat bananas, mango, apricots, jam and other fruits. They also drink palm, swimming, and glee. This virus infects people who eat bitter and eaten bamboo bites. In the backdrop of this, medical health officials have already told the locals not to sell and sell the baked butterfly fruits of the area in the Brahmagahala area. There have already been more than 12 dead in the state of Kerala. Many people are being treated in hospitals for this disease. The virus has not been detected so far. Medical experts say that once the virus is infected, the person is dead. The governments of all states are vigorously alert, as it is clear that the hobby is the source of this dangerous virus. The mechanisms of all the districts in our state have been enacted. These bats live in the caves, barks, ravites, and dark areas. Now everyone's eyes fell on the borough caves. Thousands of bats are hanging in the vast borough caves. They do not have eyes on daylight. So go out at night and eat fruits and rest in these caves during the day. These are clearly visible when tourists go to the Borra caves. Because of the number of thousands in these caves, there is a strange stink of bats. However, tourists can enjoy the beauty of the caves. Inside the cave entrance is more intricate. The boroughs are very suitable for the bats.